In Articulate Quizmaker, you can give learners feedback after they answer a question—and you can branch learners to different parts of your quiz based on their answers. To enable feedback for an individual question, do the following, depending on your current view. None: This option prevents any feedback from displaying for the question. By Question: This lets you show feedback for the overall question. For graded questions, you can provide Correct and Incorrect feedback. For survey questions, you can provide Thank You feedback. By Choice: This lets you show different feedback for each answer choice. 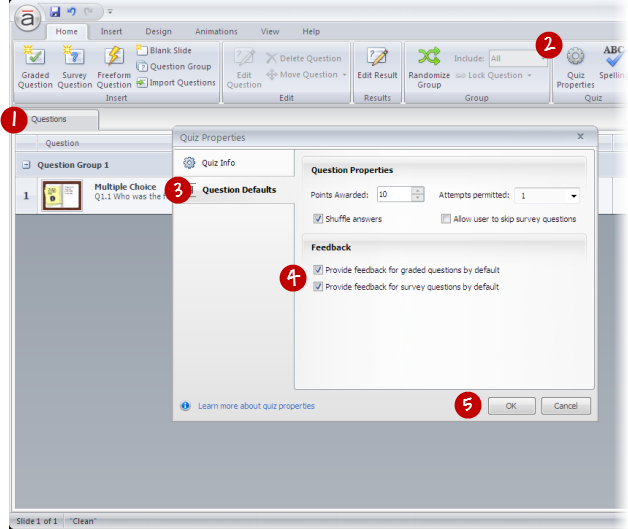 This option is only available for some question types, such as Multiple Choice, Word Bank, Pick One, Which Word, Freeform Pick One, and Freeform Hotspot. Then enter the appropriate text into the feedback fields. If you're displaying feedback By Question, the fields are at the bottom of the window. If you're displaying feedback By Choice, they're to the right of each answer choice. If you allow more than one attempt for a graded question and you're displaying feedback By Question, you can customize the Try Again feedback. If you've enabled the quiz review feature on your result slide, you can also include Post-Quiz Review feedback. To add hyperlinks, audio, or branching to your feedback, click the More button beside any feedback field. 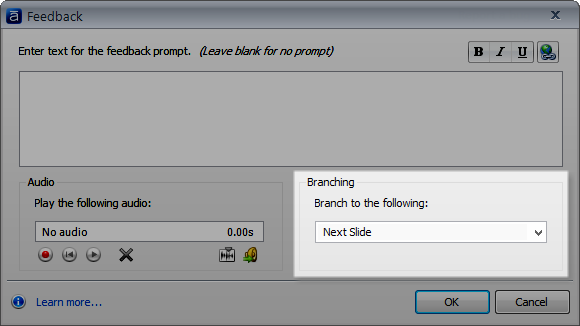 (We'll talk more about branching at the end of this tutorial.) See Using the Feedback Window for details. To change how your feedback looks, switch to Slide View, and edit the feedback layers. 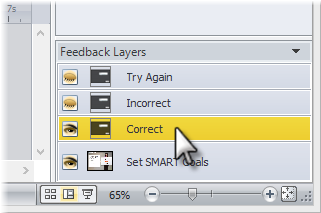 To give all the feedback layers throughout your quiz a consistent design, edit the feedback master. By Choice: This lets you show different feedback for each answer choice. 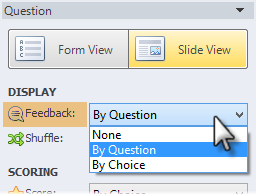 This option is only available for some question types, such as Multiple Choice, Word Bank, Pick One, and Which Word. Then use the feedback layers in the lower right corner of the screen to customize the text, images, audio, video, and other resources you plan to use for feedback. To learn more about feedback layers, see this tutorial. Note: If you're displaying feedback By Choice, you'll need to switch to Form View to enter the feedback text for each answer choice. Then you can return to Slide View to customize the feedback layers. 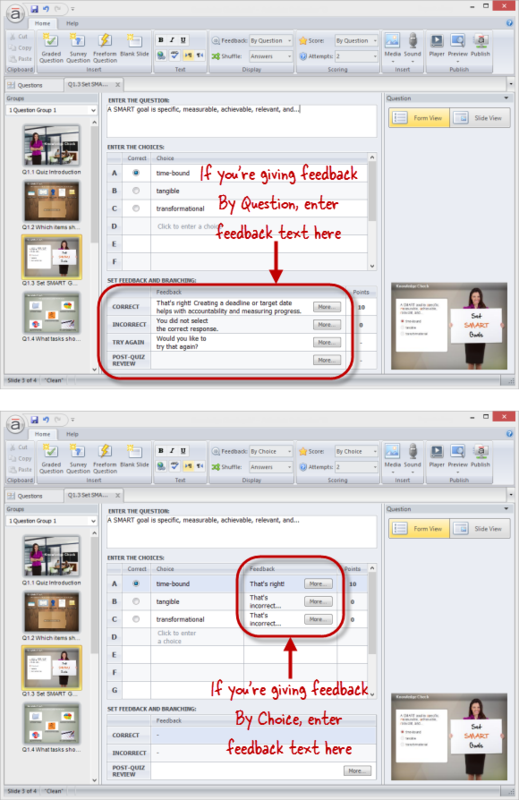 To give all the feedback layers throughout your quiz a consistent design, edit the feedback master. Go to the Home tab, and click Quiz Properties. 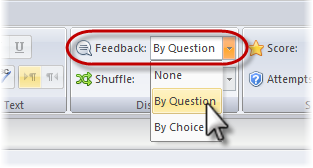 Mark one or both of the following boxes to enable feedback for new questions. Tip: Existing questions in your quiz won't be affected when you change the default settings, so it's a good idea to set your question defaults before adding any slides to your quiz. You can override the default feedback setting for any question by changing the Feedback value for that particular question (see above). To give feedback a consistent design throughout your quiz, edit the feedback master. By default, all slides branch to the next slide in the quiz, but you can change this behavior. For example, you might want to branch learners to a certain slide in the quiz if they get a particular question right and another slide if they get it wrong. First, feedback must be enabled for the question (see above). Then switch to Form View, and click the More button beside any feedback field (except Post-Quiz Review feedback). Next Slide: This jumps to the next slide in the quiz. Finish Quiz: This jumps to the result slide. Specific Question Group: Select any question group in your quiz to jump directly to it. Specific Slide: Select any slide in your quiz to jump directly to that slide.